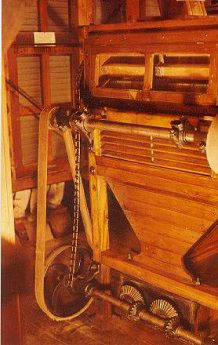 The wheat seed would begin the grinding process by going through the first of the roller mill stands (left). 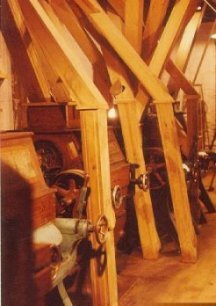 This mill stand contained the "break" rolls (very rough) that would start the grinding process by "breaking" the bran outer hull of the wheat and subsequent smoother rolls would continue the grinding until all possible flour, bran, and germ was extracted. The long vertical wooden items in the foreground are gravity chutes, part of the semi-automatic transport system used to move wheat and flour around the mill. Elevators, consisting of continuous looped belts with small buckets, would dump the product into the gravity chute, where it would slide down to the next machine or bin. The box like object in the background is one of the huge sifters of the "four box sifter" and contains large horizontal screens from top to bottom. The boxes are suspended from an eccentric shaft and the motion of the shaft when operating, causes the boxes to shake and sift flour through their screens. The lower half of each box contains controls to allow flour to cross the screens or bypass them in order to process the specific grade of flour the miller wanted. The machine in the foreground is a "plan sifter" which, besides sifting, also contains a fan to blow off fine dust. Some of the original belts used to run the mills machines were made of leather and the museum still maintains those leather belts that were left on the machines when the mill ceased operating. A strange looking machine indeed. The sock duster had one duty only, to collect dust. Fine dust from flour milling can be very hazardous, not only to the health of people breathing it (it was common for early millers to have lung congestion), but also because in quantity, dust is a deadly explosive. 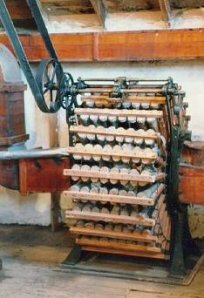 Attached to the horizontal piece of wood on each row was a series of eight cone shaped socks. Dust was blown into the machine by the two shafts, one on each side of the duster, and the small metal pipe on the left. The dust would be trapped in the socks and then later extracted in bulk and removed.